Cleaning the bathroom is probably one of the most undesirable chores at home. It’s smelly and dirty. And it takes a lot of time and effort to maintain. Designing your bathroom so that it would be easy to maintain will save you lots of time and effort in the years to come. So, before building the bathroom of your dreams, consider these practical tips to make your future bathroom cleaning tasks quick and easy. Grout is the number one enemy. Water and dirt can easily be trapped in the grout’s rough surface. Grout could accumulate all sorts of dirt and germs but it’s also the hardest to clean. You will have to scrub each line and use strong chemicals just to get them clean. To eliminate grout in your bathroom, choose solid-surface stone slabs which can be installed with fewer and minimal seam lines. Vinyl wall coverings are also a great alternative to traditional tiles. They don’t only take grout out of the picture, they also provide a wide range of textures and patterns for a beautiful effect. Plus, vinyl can just be wiped down with a sponge to make it clean. Another way to avoid grout is by installing back-painted glass on the walls, and also on counters. For an even easier option, you could just paint part of the walls which don’t really need to be tiled. Just make sure you’re using a paint specially formulated for bathrooms, or it will easily peel off or be damaged by mildew. Another way to minimize the growth of mildew is by installing a quiet fan which will help keep the place dry. If you can’t help having grout in the bathroom, at least make the grout lines as thin as possible. Don’t use glass for walls and doors. Glass looks clean and sophisticated. But wait for a few months until it accumulates soap, stains and dirt and it’s going to be the most unsightly element you have in the bathroom. 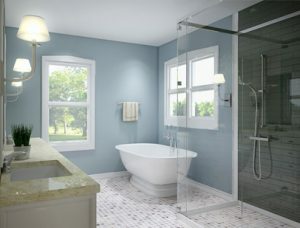 When kept clean, glass will make the whole bathroom seem clean and airy. But it’s really difficult to maintain. It’s hard to make it look as clear as it once was. Instead of glass, use a shower curtain. To keep water from splashing all over the bathroom, use a handheld showerhead with a nice long hose. Use frameless doors. If you want glass in the bathroom, at least choose to go frameless. Aluminum frames are not only a gunk magnet, they’re also really difficult to clean. Opt for wall-mounted fixtures and furniture units. When you get everything off the floor, you won’t have to get down on your knees to clean everything, especially the toilet bowl. When your toilet, vanity and storage are safely mounted on the wall, you won’t have a hard time cleaning them. Wall-mounted furniture also makes cleaning the floor a lot quicker. Even faucets work better when mounted on the wall compared to when mounted on the deck. Water and soap residue will be directed right down the sink and won’t have to make the faucet and the counter all messy and wet. Choose easy-to clean tile placement. If you like the looks and texture of small tiles and mosaic tiles, you could minimize your cleaning tasks by placing them on areas that won’t get wet too often. There are a lot of bathroom designs which look really great and even quite breathtaking. But when you’re designing one for everyday use, always think of the amount of work you will have to put in it for as long as you’re using that dream bathroom of yours.